Feels like winter is going to be around for a bit of time, doesn’t it. Brrr! In honor of the cold I am featuring a Winter DIY Round-up with some Home Decor and Craft Projects. It is actually starting to warm up here in Houston, but I know its still cold in other parts of the country. But I am somewhat glad that its still cold because I decided to incorporate Winter Decor into my design this year and I do want to enjoy as long as I can. Angie from The Country Chic Cottage shares with us a Pottery Barn Knock Off Faux Antler Wreath. The women from Uncommon Designs share a DIY Pine Cone Snowy Wreath Tutorial as well. Learn how to DIY this Frosted Candle Holder from Janel at A Moms Take. How about bringing the Outdoors In? Amanda from A Simple Touch Highlights Bringing Nature Indoors. I love this idea that Alicia from Thrifty and Chic features on her blog: Old Sweater Project: Candle Embellishment. I am featuring my Burlap Wreath Tutorial that I am currently using in my Winter Decor, but also incorporated into my Christmas Design. It was an easy project. Happen to love Snowmen? Sharon from Crafts N Coffee shares some tutorials to incorporate into your decor and/or projects that can be done with your children. These Snowy Pine Cones look like a lot of fun from Ann at My Nearest and Dearest. So I hope you enjoyed these DIY projects/crafts and found something that you can spend this weekend doing yourself or with your children. Next week I will feature some Valentines Decor and Crafts. 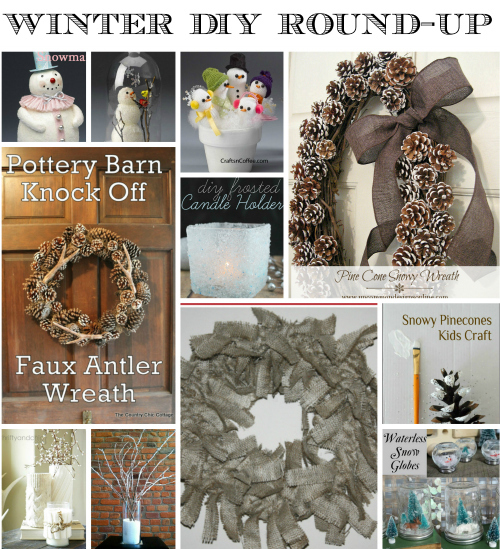 Thanks for including our snowy pinecones in your round up! Lot’s of great ideas featured. Thanks Ann!! They are fabulous. Hope you are having a fabulous Sunday!